Marc Maron came into our lives at a really difficult time: we were reeling from a devastating, major job rejection and a serious health crisis and surgery, all in the same two-week period. Marc’s show Maron on IFC was just the right type of cynical humor that we needed at that moment. We watched everything we could, the first two seasons of the show, his standup special Thinky Pain, and started listening to his WTF! podcast regularly. His struggles with career success and anxiety and rage at things ultimately out of your control resonated deeply with me. But! Seeing how he’s pulled himself out of dark places and created a niche that fits for him is inspiring, even if it might not be the pinnacle of what he ultimately envisioned for himself. I enjoy his interviews on WTF because I feel like he is genuinely trying to connect—not only with his guests but also with his listeners. His conversations and monologues are so engaging. It feels like community. As for the book, Attempting Normal, I simply could not stop listening. (And since the job thing and surgery I feel like I’ve been “attempting normal”…) I played it all day at work, not caring that Marc’s crude language and stories of hookers and drugs were maybe overheard by the students out in the hallway! (They’re all over 18, it’s college. Whatever.) This memoir isn’t about comedy per se, although there are many humorous takes on the component of weirdness in whatever situation he’s recounting. He discusses his addictions—drugs, alcohol, destructive behaviors, dark thoughts—and looks back at himself and his life with a clear-headed perspective, while acknowledging it’s still, always, a journey and process to grow, heal, and become more comfortable and forgiving of one’s self for being human. The book is full of anecdotes that are obsessive, funny, personal, and sometimes troubling. Listening to Marc tell them on audio gave them an added dose of authenticity that I’m glad to have experienced. I want to listen to it all over again, and I’m sure I will. He’s on tour right now and had a show in my hometown, Madison, Wisconsin, last month; I was DYING to go up but I had work and an orchestra gig, I couldn’t get away just then. I hope he’ll make his way to Kansas City eventually, I’d love to see him perform live! Marc’s shows, podcasts, and book were helpful to me during a rough period. He’s a new favorite and I’ll be following his work for a long time. Thank you, Marc! 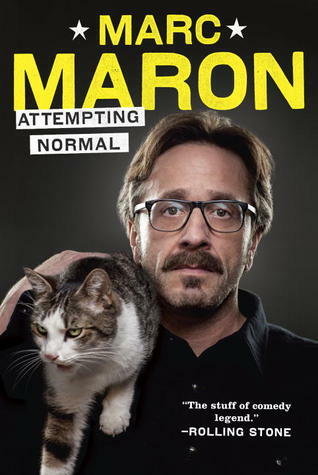 And I’m so excited to watch the third season of Maron, premiering tonight! Listened to audiobook from May 11 to 12, 2015. This entry was posted in books and tagged audiobook, humor, memoir, non-fiction, short stories and essays by kristin @ my little heart melodies. Bookmark the permalink. Such a great book! Thanks for sharing!